We were each recently injured while traveling in a foreign country! He was thrown onto the pavement yesterday, when a Mercedes swerved in front of his motorcycle from the opposite lane. In Sardinia, I think. He’s bunged up, but will be alright. 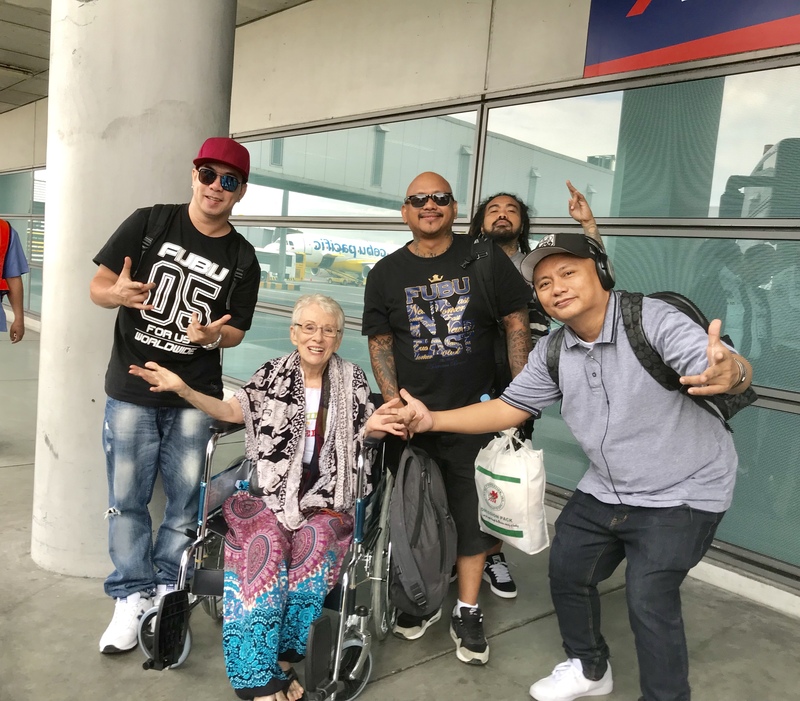 My accident, in Dumaguete, on June 26, wasn’t as dangerous as his, but led to ten days in a Philippine hospital and I am now holed up in a Cebu City hotel for a long, long rest while my broken shoulder and twisted knee completely heal. Luckily, this didn’t happen in traffic, but right in my hostel kitchen when I tripped on a brick ledge in the floor. Pain is pain and I’m sure George Clooney and I are mutually uncomfortable. But we’re alive and will recover completely. He’s younger, so his bones were stronger. I was very happy not to have very brittle bones at my age. My shoulder merely has a compression fracture, a little more serious than a hairline break, which it was originally thought to be. Things could have been much worse and I’ll get lot’s of writing done during my enforced rest. But talk about famous people! This injury led me to my sudden spectacular friendship with a top Philippine Rock Star Band, SALBAKUTA. I sat surrounded by them on the airplane coming here. They had just performed a huge stadium concert the night before. Most of them slept, but Mad, my seatmate, (with tatooed arms and sunglasses) and I, talked nonstop the whole hour-long flight. Whoulda’ thunk we would have had so much in common? I don’t know much about modern music. Their latest hit is “S2upid Luv” (Stupid Love), which is beautiful. Look it up on You Tube for a listen. The verses are in the Filipino language but the chorus is in English. Check out their band there, too. I haven’t learned to post the link here yet; but I will now make an effort to learn. And while I’m bragging about my intimacy with fame just this week, I’ll report this flattering compliment they gave me. When I first met all of them, as we were settling into our seats, they asked if I was Gloria Romero. 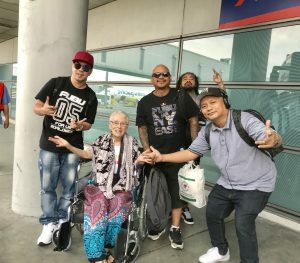 She is a big Filipino movie star of an earlier era, who is now 83. They said I look just like her and to prove it, they googled her on their cell phones. But those pictures were taken in her youth when she resembled Elizabeth Taylor. Now, I have found some taken in her eighties after her hair had turned white like mine. Okay, we do look a little alike! So all that surrounding love and feel-good messages were poured upon me, seemingly to compensate for the “owies” I was recovering from! Not a bad exchange! I hope George Clooney gets the same for his broken bones today!